Yet another rather strange concept scheduled for 2017 and, this time, it’s coming from China. The 2017 Futuristic Yuhu concept was firstly unveiled at the 2015 Shanghai Auto Show and it’s been something to talk about ever since. 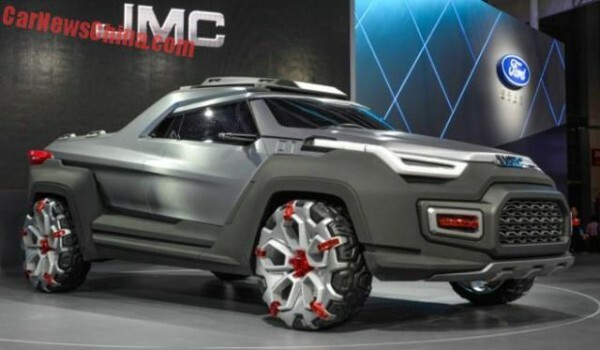 The company responsible for the obnoxiousness of the model is the JMC, which stands for Jiangling Motor Corporation, one of the China’s largest manufacturer of small and medium commercial vehicles. For those less informed, it is the same company to take the credit (or blame), along with the Changan Auto, for the controversial Land Wind X7 SUV model, stated to be a copy of the Range Rover Evoque. What the new Yuhu is all about is remained to be seen. After all, the name Yuhu does translate to a Domestic Tiger. If Batman is in the market for a new car, this just might be it. On the outside, it hardly looks like a regular SUV, more like a giant toy car. The car itself is more than 16 feet long (over 5 meters) and just below 6.5 feet (2 meters) tall. Yes, that is one big toy. At the front, the car looks as aggressive as it gets. The front bumper looks like it could savage through 6-foot wall like hot knife through butter. It is really hard to distinguish the separate parts, as the car looks like it’s been extruded from a single chunk of material. The trapezoid-like front grille takes most of the space of the front, while the headlights feature razor-sharp shape. The car will have an interesting feature – detachable front and rear lamps, which can be dismounted at will and be used as a separate emergency light. One of the most interesting features found on the care are the weird looking combination of fused wheel and tire. 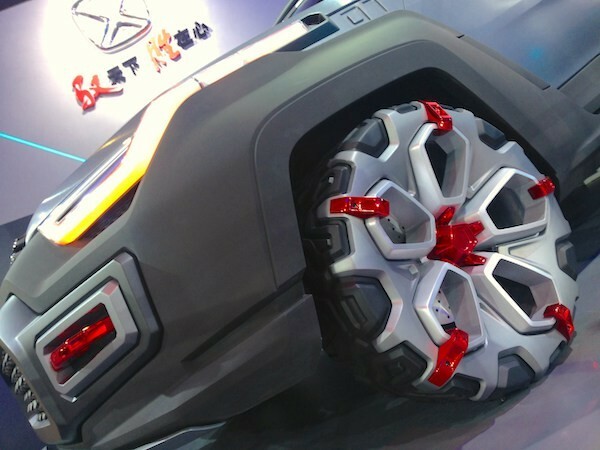 The wheels now expand their spikes over the tires and are via claw-like extensions. This feature, as bizarre as it may look, does give the car an edge on wet, muddy and snowed-in roads, but people may just cover their ears while this thing rolls down the asphalt. The exact dimensions of the rear cargo bed are unknown. The back of the car is not that extreme, compared to the front. Tail lights feature rectangular design and are long and thin, but the rear bumper does tell us that it’s the same car. As far as the interior of 2017 Futuristic Yuhu is concerned, nothing is available to the public. However, we may assume that all the standard equipment, such as the Infotainment system with large LCD screen, Bluetooth and Wi-Fi connectivity, sound system, air conditioning and other will be present, along with standard safety features including, but not limited to airbags, anti-theft system, parking assistance, lane departure system, etc. It’s been said that the cabin will be spacious and be able to accommodate up to four passengers, even though it is a pickup truck. Unfortunately, as much as we’d wanted, we couldn’t obtain the relevant information regarding the engine and its specs. One thing is for sure, though – this thing surely needs a powerful engine to run. Everything remains in question and is limited only to the company and whether or not they decide to put the car into production. 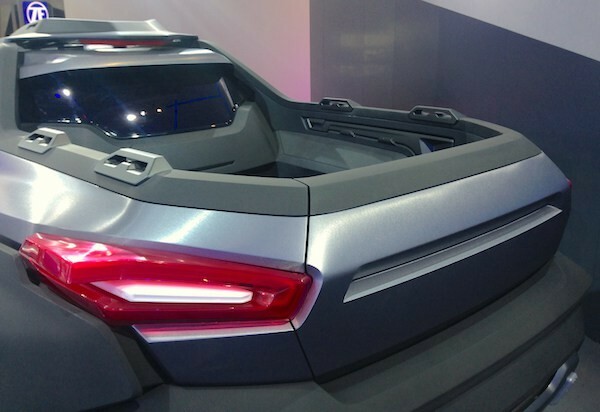 We can only guess how much 2017 Futuristic Yuhu vehicle would cost, as there is still plenty of time ahead. Regardless, we would really like to see it make into production. It may bring some pretty innovative features that will inspire other manufacturers to implement them as well or even modify them and make them better. But it is still early to tell if this would be a hit or a miss.